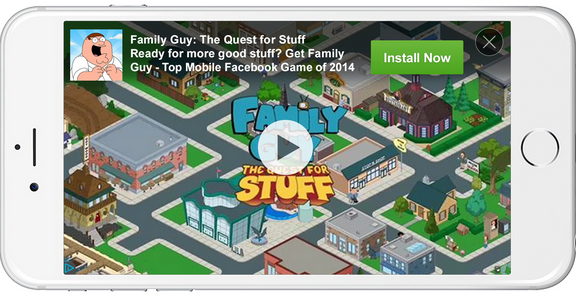 Facebook has unveiled an expansion of ad types and formats available in its Audience Network. The Audience Network was launched just a year ago as a way to help developers monetize their apps with Facebook Ads. With the expansion, Facebook is making two of its best performing units available off Facebook to empower Audience Network publishers and drive better results for advertisers. For starters, publishers can now bring the autoplay video ads experience from Facebook directly to their apps by upgrading to the latest SDK for iOS and Android and utilizing the new MediaView. Facebook notes, however, that video demand will compete with native display in the same auction to maximize yield for each impression served. In addition to autoplay video ads, publishers who already use Audience Network full screen interstitials will be eligible to deliver Dynamic Product Ads, Carousel Ads and Click-to-Play Video without changes to their existing placements. Dynamic Product Ads, for example, enable advertisers to create relevant and timely ads based on the products people have visited in their website or app. Conversely, Carousel Ads give advertisers full screen interstitials to showcase compelling imagery for their mobile app, enabling them to showcase up to five images within a single ad unit. Lastly, Click-to-Play Video is a full screen interstitial that provides people with complete control over their experience. “We have a deep understanding of what formats perform well and drive engagement in Facebook News Feed and are taking two of our best performing units and making them available off Facebook to further empower Audience Network publishers and help drive results for advertisers,” the social network said in its announcement.